Summer vacation is winding down and I’ve been clinging to the days with a fierce grip. It’s been hot and unfortunately there is a haze in the air from all the wildfires. The mornings light is diffused and muted, at dusk the sun is a giant ball of orange in the sky, no blue skies or pink hues in the evening, I’m over it. What I’m not over are the lazy mornings, the ones when my youngest will wake first and we’ll snuggle on the couch reading ”The Penderwicks” and “Mrs. Frisby and the Rats of Nimh”. I’ve loved every family bike ride, cookouts with friends, camping trips, gardening, reading Shel Silverstein poems at night with my oldest and loving that he still finds them humorous. I’ve been cooking from the garden, most of our weeknight meals have been simple, now working BLT’s into the mix with all these fresh tomatoes. Outdoor grilling is a must and I’ve been throwing a cast iron skillet on our gas grill on the deck and cooking outside too, layering flavors, running around to the side of our house to grab a handful of herbs from their box. I’m trying to mentally gear up for the start of next week, the early bedtimes, the start of homework, crossing guard duty for my oldest, back to remembering library books are due, fieldtrip permission slips need to be turned in, book reports and the task of just getting out the door in the morning with backpacks stuffed with the essentials. The flip side of this of course is that my boys love school, love being with their friends and routine is good, structure is good, life’s pace just picks up a bit. Even though the weather has been warm, I’ve been compelled to bake a bit. Some crumbles and crisps, the occasional pie and there’s this sour cherry cake. Sour cherries happen to be the prize of summer, their window is so tiny and they are far and few to find at markets. I’ve been lucky enough to pick them in the past, it’s a very sticky event but worth the effort. The shelf life is fleeting so once picked it’s a race to pit them and either can, freeze or start baking. 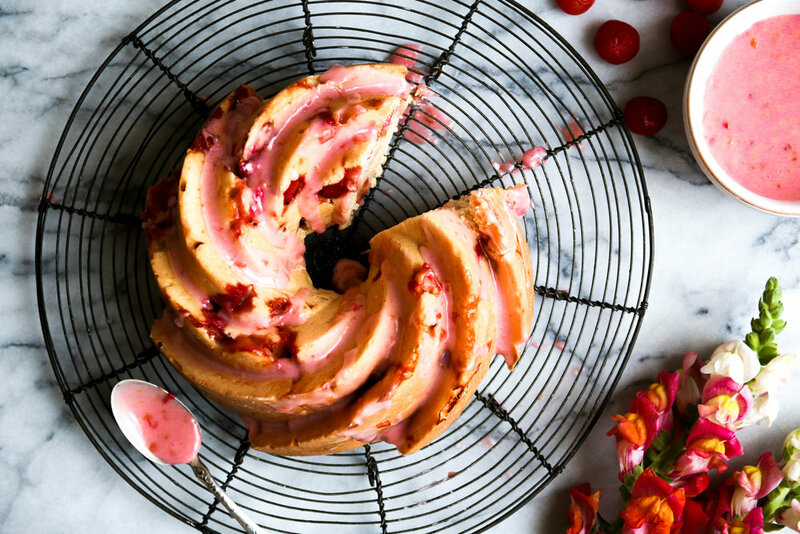 This cake was loosely adapted from a recipe that actually called for dried sour cherries soaked in a cherry liqueur, it was delicious but I wanted more sour cherry taste and I liked the idea of fresh fruit. I made several versions of this and decided on a buttermilk batter that wasn’t too sweet and let the cherry drizzle add that little extra sweetness. Happy Summer friends. Preheat oven to 350 degrees F, grease and lightly flour 6 cup Bundt cake pan. Sift the flour, almond meal, baking powder and salt into a large bowl. In a mixing bowl beat butter and sugar until pale and fluffy, around 5-8 minutes, then add 1 egg at a time until incorporated. Add 1/2 of dry ingredients once incorporated add the remaining dry ingredients. Next add the almond extract and buttermilk, gently folding in the ingredients until the batter is smooth. Fold in one cup of pitted cherries into the cake batter. 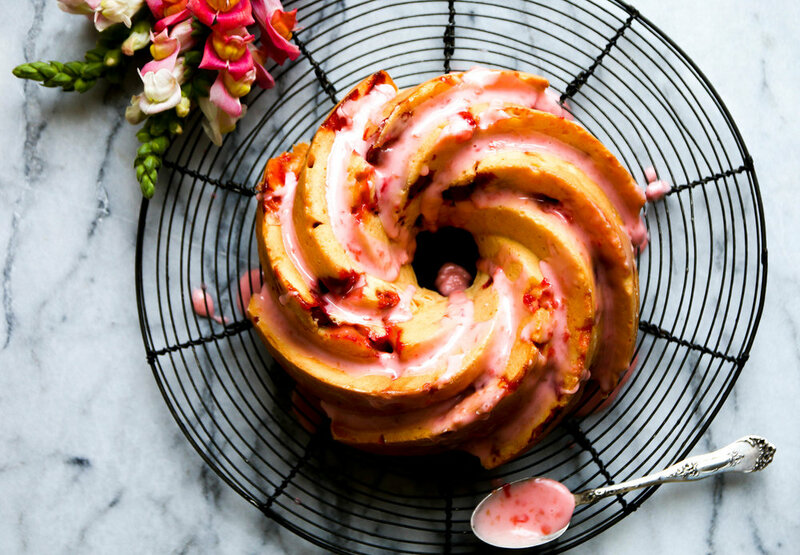 Once the cherries are mixed in, scoop the batter into prepared Bundt pan and bake for 50 minutes, or until a metal skewer inserted in the center comes out clean, the top of the cake looks golden, feels springy and a little firm to the touch. Place the pan on a wire rack to cool for 20 minutes before turning out the cake to completely cool on the rack. 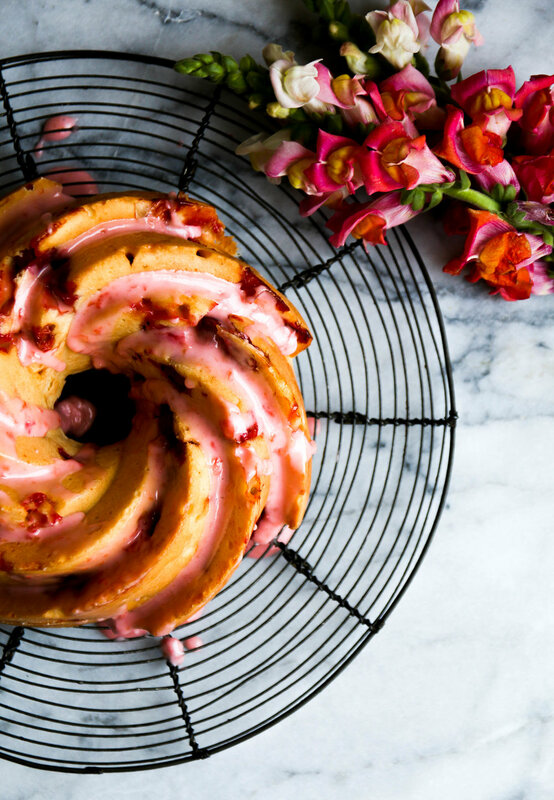 If you wish to make a glaze, combine 1 cup of confectioners sugar with 1/4 cup of remaining pitted cherries in a small food processor and blitz until you have a sticky glaze to drizzle over the cake.